Given all the technology that we're in the middle of, I would be so pleased if someone would look at one of these prints and say, 'You know, I feel like that.' What I'm concerned about now is creating a metaphor for what the figure really is. Color drypoint, sugar lift and spit bite aquatints with hard ground etching. Image size: 45 x 36"; paper size: 52 x 41". Edition 35. Image size: 18 x 14"; paper size: 26 x 21". Edition 15. Color sugar lift aquatint with drypoint on gampi paper chine collé. Color sugar lift and spit bite aquatints with hard ground etching. Color sugar lift and spite bite aquatints with hard ground etching. Image size: 45 x 36"; paper size: 52 x 42". Edition 35. Color sugar lift aquatint with aquatint and drypoint. Image size: 16 x 13"; paper size: 25 x 21". Edition 30. Image size: 16 x 13"; paper size: 25 x 21". Edition 15. Image size: 16 x 12"; paper size: 25 x 20". Edition 15. Color sugar lift and spit bite aquatints with soft ground etching and aquatint. Image size: 31¼ x 23¼"; paper size: 31¼ x 23¼". Edition 20. Color spit bite aquatint and aquatint with texture from the back of a discarded plate. Image size: 18 x 14"; paper size: 27½ x 22½". Edition 30. Color sugar lift and spit bite aquatints with aquatint and texture from the back of a discarded plate. Image size: 15¾ x 12"; paper size: 25¾ x 21". Edition 30. Image size: 15¾ x 10½"; paper size: 25¾ x 19½". Edition 30. Image size: 11¼ x 15¾"; paper size: 20½ x 25". Edition 30. Image size: 13¾ x 17¾"; paper size: 23½ x 26". Edition 30. Color spit bite aquatint with aquatint on gampi paper chine collé with texture from the back of a discarded plate. Image size: 14½ x 11¼"; paper size: 24½ x 20½". Edition 20. Color sugar lift and spit bite aquatints on gampi paper chine collé and texture from the back of a discarded plate. Image size: 17¾ x 13¾"; paper size: 27¼ x 22½". Edition 20. Image size: 29¾ x 22¼"; paper size: 40½ x 31¾". Edition 40. Color spit bite aquatint with aquatint and texture from the back of a discarded plate. Image size: 16 x 12¼"; paper size: 27½ x 22". Edition 25. Image size: 16 x 13"; paper size: 27½ x 22½ ". Edition 25. Image size: 18 x 14"; paper size: 27½ x 22½". Edition 25. Image size: 16 x 13"; paper size: 27½ x 22½". Edition 25. Image size: 22 x 14½"; paper size: 32¾ x 23¼". Edition 25. Color soft ground etching with drypoint, spit bite aquatint and aquatint. Image size: 22 x 30"; paper size: 34½ x 42". Edition 40. Color drypoint with spit bite aquatint. Image size: 5¼ x 8"; paper size: 12½ x 14". Edition 20. Drypoint with spit bite aquatint printed in brown. Image size: 11½ x 8"; paper size: 17¾ x 13". Edition 10. Sugar lift aquatint with spit bite aquatint printed on gampi paper chine collé. Image size: 12 x 15"; paper size: 16 x 20". Edition 20. Image size: 12¼ x 16"; paper size: 16 x 20". Edition 20. Sugar lift aquatint with spit bite aquatint on gampi paper chine collé. Image size: 32½ x 28½"; paper size: 44½ x 38½". Edition 20. Image size: 32½ x 28½"; paper size: 44¼ x 38½". Edition 20. Color drypoint with soap ground and spit bite aquatints and aquatint. Image size: 29¾ x 24"; paper size: 40¼ x 32½". Edition 35. Image size: 29½ x 23½"; paper size: 40¼ x 32½". Edition 35. Image size: 29½ x 23½"; paper size: 40¼ x 32½". Edition 50. One in a series of 18 color monoprints. Image size: 21¾ x 19"; paper size: 33¾ x 30". Image size: 29¾ x 23¾"; paper size: 38¾ x 30¼". “Nathan Oliveira’s passion is for continuing an inner-directed artistic tradition attached to the human subject…. The evocation of mystery that the viewer experiences in Oliveira’s work derives from a depth of feeling refracted through artistic tradition and transmitted to the spectator by the artist’s hand,” wrote Peter Selz in a catalog essay for Oliveira’s 2002 painting and printmaking retrospective at the San Jose Museum of Art, California (traveling to the Neuberger Museum of Art in Purchase, New York, and three other museums). Oliveira was born in 1928 in Oakland, California, to a family of Portugese immigrants. He studied painting and printmaking at the California College of Arts and Crafts (now the California College of the Arts) in Oakland and at Mills College in Oakland with Max Beckmann during the summer of 1950. After two years in the U.S. Army as a cartographic draftsman, he began teaching painting at CCA, and drawing and printmaking at the California School of Fine Arts (now the San Francisco Art Institute) in 1955. Since then, he has had guest teaching appointments at many art schools and universities. He held a tenured teaching position at Stanford University from 1964 until he retired in 1995. He lived in Stanford, California until his death in November, 2010. In 1959 Oliveira was the youngest painter included in the important exhibition New Images of Man at the Museum of Modern Art in New York. A survey of five years of his paintings and works on paper was shown at the Art Gallery of the University of California, Los Angeles, in 1963, and a fifteen-year survey of his paintings was organized by the Oakland Museum of California in 1973. 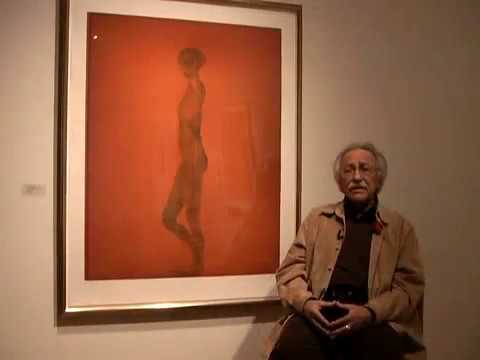 He had a print retrospective in 1980 at California State University, Long Beach, and the California Palace of the Legion of Honor in San Francisco organized a survey of his work in monotype in 1997. Oliveira was elected to the American Academy of Arts and Letters in 1994, and he has received many other awards, including a Guggenheim Fellowship, two honorary doctorates, and, in 2000, a membership in a distinguished order conferred by the government of Portugal. His work is in the collections of many museums, among them the Art Institute of Chicago, the Carnegie Institute in Pittsburgh, the Metropolitan Museum of Art in New York, and the Museum of Modern Art in New York. He was represented by the DC Moore Gallery, New York, the Marsha Mateyka Gallery, Washington, D.C., and the John Berggruen Gallery, San Francisco. Artist Nathan Oliveira discusses making prints at Crown Point Press in San Francisco.